Crazy Uncle Joe Arpaio and his disreputable attorney Larry Klayman from Freedom Watch continue their losing streak for this frivolous lawsuit. 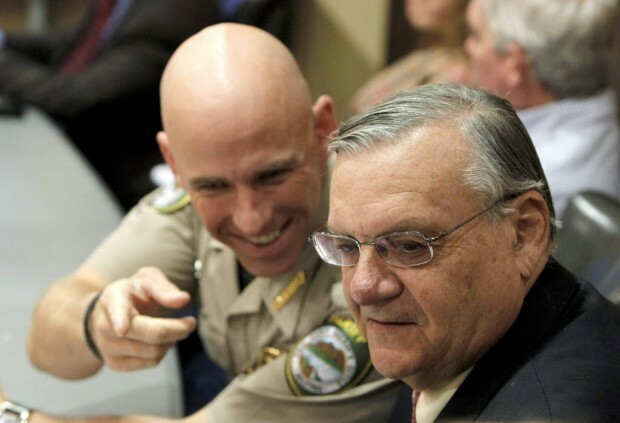 The Court really ought to impose Rule 11 sanctions on Arpaio and his disreputable attorney for frivolous litigation. See, Federal judge tosses Crazy Uncle Joe Arpaio’s frivolous lawsuit, and Court of Appeals is skeptical of Crazy Uncle Joe Arpaio’s frivolous lawsuit. A federal appeals court rejected a lawsuit brought by Sheriff Joe Arpaio challenging President Obama’s immigration executive order Friday. A three-judge panel of the U.S. Court of Appeals for the D.C. Circuit agreed with a lower court’s decision that Arpaio — the Maricopa County, Arizona sheriff known for his anti-immigration antics — did not have standing to bring the challenge, which sought to block the Department of Homeland Security from implementing the new programs. “We conclude that Sheriff Arpaio has failed to allege an injury that is both fairly traceable to the deferred action policies and redressable by enjoining them, as our standing precedents require,” the decision’s author, Obama-appointee Justice Nina Pillard wrote in the Opinion (.pdf). Arpaio had presented two lines of argument as to why he, as the chief law enforcement agent of the nation’s fourth most populous county, had standing to bring a challenge to the Obama administration’s immigration actions. Firstly, he said that the President’s Deferred Action for Childhood Arrivals (DACA) and Deferred Action for Parents of Americans (DAPA) programs were acting as a magnet that would bring more undocumented immigrants across the border, and thus weigh on his law enforcement resources. Secondly, he said that because of the programs, his agency would be arresting more undocumented immigrants who committed crimes, and cost him in terms of jail space and manpower. Pillard spent 23 pages knocking down both of Arpaio’s points. Pillard rejected the argument put forth by Arpaio that the 2014 migrant crisis was caused by Obama’s previous immigration executive order that shielded certain young people from deportation, which he expanded as part of the executive order last fall. “Just as we do not infer that the rooster’s crow triggers the sunrise, we cannot infer based on chronology alone that DACA triggered the migrations that occurred two years later,” she wrote. She also said the logic of Arpaio’s suggestion that his agency would be arresting more criminals due to Obama’s immigration policies didn’t hold up. Brown argued that Friday’s decision should not be looked at as to what the court thought of the merits of the other challenges to Obama’s immigration actions working their way up the judicial ladder, namely the lawsuit being led by Texas. The Fifth Circuit Court of Appeals heard oral argument in State of Texas, et al. v. USA, et al. on July 10. 2015. A decision is still pending, and when announced, will be appealed to the U.S. Supreme Court. 5th Circuit Court of Appeals hears oral argument in Obama immigration executive orders appeals.